1 of 5 Heat gas grill to medium-high or coals in a charcoal grill to medium-hot. Lightly coat grill rack with oil or cooking spray. 2 of 5 In a medium-size bowl, blend mayonnaise, ketchup, relish, 1 tablespoon of the dried onion and sugar. Cover and refrigerate. 3 of 5 In a large bowl, mix together ground chicken, remaining tablespoon dried onion, Worcestershire sauce, garlic powder and pepper. Form into 12 equal-size patties. 4 of 5 Grill burgers for 2 to 3 minutes per side or until temperature registers 160 degrees F on an instant-read thermometer. Remove to a plate. 5 of 5 To serve, set aside 6 bun tops. Spread each bun bottom with 1 tablespoon sauce. Stack each with a burger and 2 tablespoons shredded lettuce. 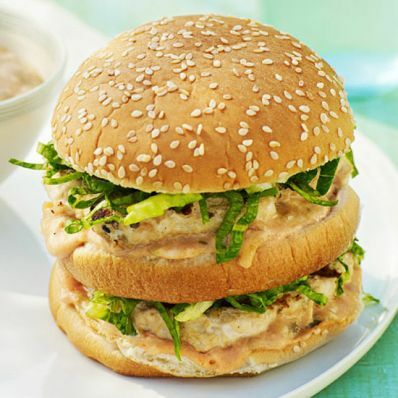 Top each with a bun half; repeat stacking with sauce, burger and lettuce. Top each with a reserved bun top. Serve with remaining sauce. Per Serving: 45 g carb., 31 g Fat, total, 215 mg chol., 9 g sat. fat, 2 g fiber, 858 mg sodium, 598 kcal cal., 35 g pro.